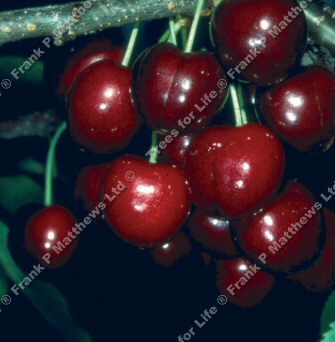 A fantastic black eating cherry, Lapins 'Cherokee' (Prunus avium 'Lapins Cherokee') was first introduced in Canada during 1984. A result of the crossing of cherry varieties Van x Stella. The cherries are large and delicious. A favourite black garden cherry. One of the first self fertile varieties to appear. Lapins 'Cherokee' will shed its fruit readily when green but there is always ample left to ripen later. An upright and strong growing tree. Self-Fertile/Not Self-Fertile: Lapins cherry tree is self fertile although your Cherry harvest maybe improved with another Cherry tree planted close by.